Every once in a while, a product with cute as hell packaging would come along and steal my heart. 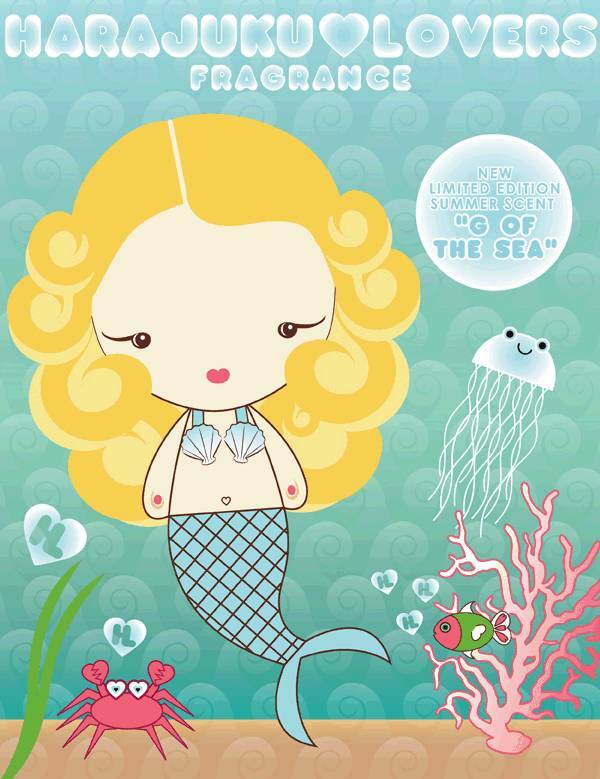 And one such item in the past month was a limited edition from Harajuku Lovers - G of the Sea. Now G is no ordinary Harajuku character, she’s not only more prettier than her other girly Harajuku friends but she’s actually a mermaid, the very reason why I fell in love with her when I saw her for the first time. G is adorned in a cute seashell bikini and melts my heart with her flowing blond locks and gorgeous green tail that flips off to one side and sits on top a round blue bottle. She comes all nicely wrapped up a her own special underwater themed box, complete with cute little imprinted sea critters and even a seahorse play mates to keep her company when she is at home in her under sea playground. Developed by Perfumer Gil Clavien from Firmenic, G holds a whimsical fresh woody scent that instantaneously reminds one of summer fun by the sea. Upon first spray G of the Sea, you pick up the scent of fresh apples and crushed berries along with water lilies in the tops notes and get the sense you're heading towards the summer evening to cool off with pina-coladas. As it settles, a floral middle notes peeks through and a bouquet of freesia mingled with jasmine pink peony lingers around. It finally finishes with a heart of sensual musk and woody layer of amberwood. Whenever I wear this, I daydream of being transported to a tropical island and although the scent can be fleeting, I just have to re-apply a few hours later to re-live the day dream again. Gwen Stefani has really outdone herself this time in the packaging department. 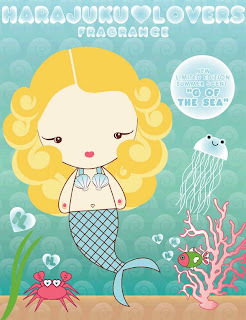 If you are a collector of the Harajuku Lovers, then I would rush out and cast a net over G whilst she is by the sea before she mystically disappears into the ocean again. EDT 30ml RRP A$65 on counters now at Myer, The Perfume Connection and selected pharmacies nationally for a limited time. US readers can pick this up for US$45 at Sephora. Ah~! Just the packaging alone would win me over!! So cute! She is very cute - that's why I'm suckered in by here. As for scent she is ok but I find I'm still more fond of florals.